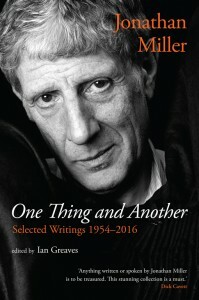 ‘In the end “one thing and another” is all I’ve ever been interested in’, writes Jonathan Miller in the foreword to this fascinating new collection of his various writings, spanning seven decades. Miller is a little dismissive in the foreword, describing the various pieces collected here as ‘an assortment of life-long obsessions and passing fancies’; the product of a magpie mind. But whether Miller recognises it or not, ‘one thing and another’ is quite an appropriate phrase for encapsulating a key theme that emerges from this book – Miller’s constant movement between two different orders of discourse and his frequent efforts to use ‘one thing’ in order to try to understand ‘another’. It was in the early 1960s, as Miller was finding fame on the London and New York stages with the Beyond the Fringe satirical revue, that C.P. Snow’s pronouncement about the ‘two cultures’ of humanities and sciences was also becoming widely known and discussed. Snow lamented the seemingly irreconcilable gulf between science and the arts in which he claimed many scientists had never read Charles Dickens, while many literary intellectuals remained stubbornly ignorant of the Second Law of Thermodynamics. How best to bridge the gap? Jonathan Miller could almost have been invented as a response to such concerns, moving easily, as he does in this collection, from writing about ‘intestinal ethics’ in hospitals to ruminating on how best to produce an opera (both, perhaps, involving cloacal processes). Because of his successful twin-track careers in medicine and the arts, Miller is often summed up as a ‘polymath’ but this belies his constant bringing of analytic discourses and approaches from the sciences, particularly the medical sciences, to the seemingly more irrational, intangible domain of culture. Can arts and culture be examined and dissected like a human body on an operating table or mortuary slab? Miller, in these writings, brings his innate microscopic curiosity to bear upon considerations of theatre, film and television as well as the other arts, and in true scientific vein, is constantly asking questions about ‘what we do’ and ‘why we do it’, which others working in these fields might simply take for granted. Thus he asks in 1987: why do we laugh? And in 1998, as part of a discussion of reflections in paintings: how is it that when we look into a mirror we know instantly, from an early age, that it is ourselves staring back at us? 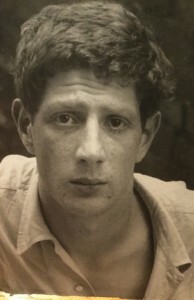 Jonathan Miller in the 1950s. Image courtesy of Oberon. Some may see these sorts of questions as ‘nowhere-type’ questions, of no immediate artistic use or value, but Miller in his writings on human behaviour and culture is constantly asking them and constantly probing; like a lepidopterist with a particularly interesting butterfly. Yet the butterfly is fragile and it can break apart if examined too closely. By the time we get to 2004 and anthologised extracts from the scripts of his last major BBC television series to date, Atheism: A Rough History of Disbelief, we find Miller in New York, post-9/11; a life-long unbeliever struggling to make sense of the unsettling persistence of the religious impulse in the twenty-first century. Miller admits to complete perplexity, finding all religious ideas and beliefs ‘alien, uncongenial and, to be frank, almost unintelligible’. His quest to try to understand leads him to interview linguistic philosophers, social anthropologists and the late American playwright Arthur Miller. But there is a sense of the language and tools of logical enquiry being applied to another type of discourse entirely that runs counter to logical enquiry. In seeking to rationalise and explain away ‘irrational’ realms of the emotional and the spiritual within human beings, Miller is a bit like the person invited to a dance who not only cannot understand the various dance moves but is completely unable to see why anyone would wish to bother with them in the first place.